Making an animated movie is like swimming across the English channel: difficult and exhausting. The idea seems almost ludicrous. How do you take a story idea and render two hours of footage from pure imagination? Finished films such as Shrek might look effortless, but they involved countless animators and rendering artists. And, more than anything, animated films test the power of modern computers. Recently, TechRadar visited a DreamWorks Animation studio near San Francisco and met with a group of technicians. The goal? To find out what kind of computer horsepower they require, and how they push the limits of computing. One of our first realisations, after meeting an animator, is that just about every frame of a movie such as Rise of the Guardians is created using an HP Workstation Z820. This behemoth is outfitted with two Intel Xeon E5-2687W processors, running at 3.1GHz each. Because each system has eight cores, animators can use 16 cores for processing animation files. On a system with 32GB of RAM, a 160GB SSD boot drive (and a 500GB data drive), with an Nvidia Quadro 5000 graphics card (which itself has 352 cores), a technician opened an animated sequence for a new character in an upcoming movie. DreamWorks set up a demo between the HP Workstation Z800 and HP Workstation Z820. These systems are similar, but the Z800 has eight cores and the Z820 has 16. The character sequence consisted of 16 frames of video on the Z800, and 32 frames on the Z820. Both rendered in just 10 seconds. That rendering time is a night-and-day difference between what animators used for older movies such as Shrek. That rendering time is significant, says the DreamWorks head of research and development Jeff Wike, because of the amount of work that goes into making an animated film. 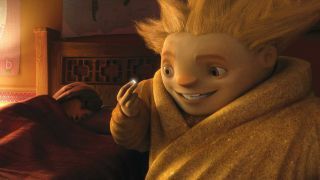 For a movie like Rise of the Guardians, there might be 100,000 storyboards. On some movies, DreamWorks might recreate storyboards five times because it wants to make sure that each slight turn in the story, each sequence, and each specific scene it will render is ready to be digitised by animators. There's a sense that the story has to be right before it ever sees the light of day on a workstation. During another demo at the DreamWorks office, showing a scene from the movie Madagascar 3, an animator showed how he could experiment with Alex the Lion as he fumbles around a room. Wike says the quick rendering promotes more experimentation because there isn't the pain point of knowing you will have to sit and wait for each scene to render before you know if you like it. If you can imagine the total effort required, a typical DreamWorks film has about 270 billion pixels that have to be precisely choreographed in the final movie. To create an animated film such as Rise of the Guardians, DreamWorks might render as much as 65 million hours of footage to come up with 90 minutes of worthwhile materials. Movie files occupy as much as 250TB of storage. Each animator might have 96GB of RAM on their personal Z800 or Z820 at a time while the movie is being made. Most films take 3-5 years to make, but the computer processing time has made a major dent in that timeframe, and has allowed DreamWorks to make more films per year. "We push every single bit out of our computers," says Wike, who tells us the biggest change in recent years is that the processing with multi-cores means directors have more choices. He says on one recent film, a director wanted to see how a piece of cloth looked in a scene. In the past, the response might be - "let me try that but come back tomorrow to see the render". Wike says movies turn out better now because a director can see a near-instant render and make decisions almost on the fly. "We have more iterations now," he says. "In a live action movie, an actor might be able to do 30 takes to get the right one. We are now able to do that on a computer with animation." Wike says the processing speed is also important for the full realisation of a scene. Animators can throw everything they want into a scene: a dark forest with nooks and crannies, sun-bathed and full of twisting trees. There is more creative expression on films now because animators are able to experiment with an entire scene on the desktop, rather than only seeing part of the picture. Interestingly, DreamWorks says it has a close partnership with HP because it doesn't like to get surprised by technology. The multi-core systems are fine-tuned for production work. In the hurried pace of creating an animated film, the computer has to be a reliable, predictable tool.